Leaders with a passion for diversity and science who have uplifted Americans through the arts, public service and higher education will address graduates at The University of Toledo’s spring commencement ceremonies Saturday, May 7, in Savage Arena. During the 9:30 a.m. ceremony, former U.S. Congressman and physicist Dr. Rush D. Holt, who leads the world’s largest multidisciplinary scientific and engineering society, will speak to graduates from the colleges of Adult and Lifelong Learning, Health Sciences, Social Justice and Human Service, and the Judith Herb College of Education. 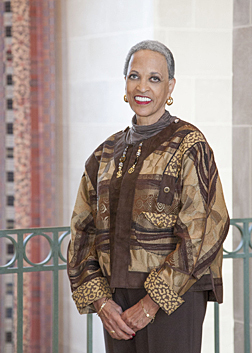 Dr. Johnnetta Cole, director of the Smithsonian National Museum of African Art and the first African-American female president of Spelman College, will speak at the 2 p.m. ceremony for the colleges of Business and Innovation, Communication and the Arts, Natural Sciences and Mathematics, and Languages, Literature and Social Sciences. There are 2,843 candidates for degrees: 234 doctoral candidates, 727 master’s, education specialist and graduate certificate candidates, and 1,882 bachelor’s and associate’s candidates. The ceremony will be streamed live on video.utoledo.edu. 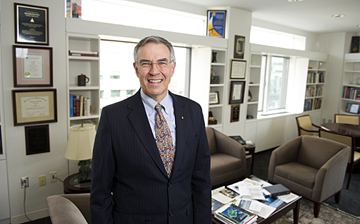 Holt, who will receive an honorary doctor of public service degree during the morning ceremony, is the chief executive officer of the American Association for the Advancement of Science and executive publisher of the Science family of journals. Holt previously served as assistant director of Princeton University’s Plasma Physics Laboratory, one of the largest alternative energy research facilities in the country. Cole, who will receive an honorary doctor of humane letters degree during the afternoon ceremony, made history nearly 30 years ago as the first African-American female president of Spelman College in Atlanta. She later served as president of Bennett College for Women, making Cole the only person who has been president of both historically black colleges for women in the United States. She also was the first woman elected to the board of Coca-Cola Enterprises. She was the first African American to serve as chair of the board of the United Way of America. • College of Engineering — graduate commencement Thursday, May 5, at 5 p.m., and undergraduate commencement Saturday, May 7, at 3 p.m. Both ceremonies will be held in Nitschke Hall Auditorium. • College of Nursing — Friday, May 6, at 1 p.m. in Savage Arena. • College of Law — Sunday, May 8, at 1 p.m. in the Student Union Auditorium. • College of Pharmacy and Pharmaceutical Sciences — Sunday, May 8, at 10 a.m. in Savage Arena. • College of Medicine and Life Sciences — Friday, May 27, at 2 p.m. in the Stranahan Theater, 4645 Heatherdowns Blvd., Toledo. The new University College will serve adult students pursuing individualized degrees and first-year students exploring the variety of majors The University of Toledo has to offer. The creation of University College, which was approved April 18 by the UT Board of Trustees, is a merger of the College of Adult and Lifelong Learning and YouCollege with UT Online. “Serving students is the mission of all colleges at The University of Toledo and by organizing University College in this way, we will enhance how we can serve adult learners and students who are undecided about their areas of study,” UT President Sharon L. Gaber said. Dr. Barbara Kopp Miller, associate provost for online education and director of the Center for Successful Aging, will serve as dean of University College, which will be in place July 1. The about 700 students in the College of Adult and Lifelong Learning and the about 1,700 students in YouCollege will be enrolled in the new University of College. The College of Adult and Lifelong Learning was created in 2010 as an evolution of a previous University College to focus services for adult students. Through a program called prior learning assessment, UT offers adult learners the ability to earn college credit for life experiences using portfolios, standardized testing and industry certification to determine college credit. The college’s degree programs include individualized studies, professional studies and liberal studies. Since 2013, YouCollege has served students in the Department of Exploratory Studies who are undecided about their majors or working on requirements to get into the program of their choice. University College’s academic units will be organized into a Department of Interdisciplinary Studies and Special Programs, and a Department of Exploratory Studies. Dr. Dennis Lettman, who serves as dean of the College of Adult and Lifelong Learning, is retiring at the end of the academic year after 27 years of service to UT. Julie Fischer-Kinney, who serves as interim dean of YouCollege, will continue in her role as assistant provost for student success and retention leading the University’s success coaching program, which will be organized in a Center for Success Coaching. The University offers more than 500 online courses through UT Online, which also will be part of University College. UT Online includes the departments of Learning and Academic Technology, Instructional Design and Development, Faculty Services and Help Desk, and Compliance and Assessment. UT’s military affairs, testing and workforce development services also will be offered through the college. “University College truly serves the entire University through the services that it provides,” Kopp Miller said. Kopp Miller joined the Medical College of Ohio in 1991 and has held a number of faculty appointments and administrative roles at UT. With a scholarly expertise in the area of gerontology, she teaches in the Department of Public Health and Preventative Medicine. She received her bachelor’s, master’s and doctoral degrees in psychology from Bowling Green State University. A new University College that will merge the College of Adult and Lifelong Learning and YouCollege with UT Online was approved Monday by the UT Board of Trustees. University College, which will be established July 1, will be led by Dr. Barbara Kopp Miller, associate provost for online education and director of the Center for Successful Aging. The about 700 students in the College of Adult and Lifelong Learning’s individualized studies degree programs and the about 1,700 students in YouCollege’s Department of Exploratory Studies will be enrolled in the new University College. University College also will oversee the University’s more than 500 online courses, as well as provide UT’s military, testing and workforce development services. Christi Paul, anchor of CNN New Day Weekends and HLN’s Daily Share, will address graduates at The University of Toledo’s fall commencement Saturday, Dec. 19, at 10 a.m. in Savage Arena. The UT graduate and Bellevue, Ohio, native, who also will receive an honorary degree during the ceremony, will address more than 2,000 candidates for degrees, including 138 doctoral candidates, 556 master’s degree candidates and 1,372 bachelor’s degree candidates. The ceremony will be streamed live at http://video.utoledo.edu. This will mark the first University of Toledo commencement for UT President Sharon L. Gaber. The national journalist graduated from UT in 1993 with a bachelor of arts degree in communication with a focus on broadcast journalism. Paul has covered many high-profile events throughout her distinguished career; these include President Barack Obama’s second inauguration, Hurricane Sandy, and the Casey Anthony murder trial. She was in the anchor chair, walking heartbroken viewers through the early hours of the tragic shootings at Sandy Hook Elementary School and Virginia Tech. Prior to joining CNN and HLN in 2003, Paul worked as an anchor and reporter in Phoenix and Boise, Idaho. The Idaho Press Club honored Paul for her series about a brave 4-year-old girl who underwent a five-organ transplant. Paul began her career at WDTV in Clarksburg, W.Va. The wife and mother of three also is passionate about helping children. Along with the National Center for Missing and Exploited Children, Paul is co-founder of the “Find Our Children” series that airs on HLN. Viewers have helped bring home 35 missing kids as a result of the news profile segments. The center honored Paul in 2012 with its prestigious Hope Award for her efforts to make the world a safer place for children. Paul serves on the National Advisory Council for the One Love Foundation, which works with teens to help end dating violence. She also serves on the advisory board for When Georgia Smiled that helps victims of domestic violence and sexual assault find healing, safety and joy. 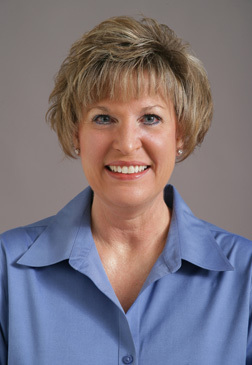 UT recognized Paul in 2006 as an Outstanding Alumna of the former College of Arts and Sciences. The fall commencement ceremony will recognize graduates from the colleges of Adult and Lifelong Learning; Business and Innovation; Communication and the Arts; Judith Herb College of Education; Health Sciences; Languages, Literature and Social Sciences; Medicine and Life Sciences; Natural Sciences and Mathematics; Pharmacy and Pharmaceutical Sciences; and Social Justice and Human Service. • College of Engineering — graduate commencement Thursday, Dec. 17, at 5 p.m.; undergraduate commencement Saturday, Dec. 19, at 3 p.m. Both ceremonies will be held in Nitschke Hall Auditorium. • College of Nursing: Friday, Dec. 18, at 1 p.m. in Nitschke Hall Auditorium. Five University of Toledo staff members were chosen from more than 1,000 proposals to speak at the 39th annual National Academic Advising Association conference held in October in Las Vegas. The association is the leading organization for academic advising. More than 4,000 attended the conference, where session topics ranged from retention issues and strategies to programming and other aspects of academic advising. Fourteen University administrators attended the conference; these included success coaches, academic advisers, assistant directors and assistant provosts. Gerasimiak said strong academic advising programs play a key role in student success, retention and graduation. UT members who gave presentations were Gerasimiak; Creamer; Melissa Gleckler, senior specialist for prior learning and credit assessment in the College of Adult and Lifelong Learning; Jennifer McDowell Tharpe, academic adviser in the College of Business and Innovation; and Dr. Julie Fischer-Kinney, assistant provost for student success and retention. Gleckler and Gerasimiak gave a presentation titled “A Model Prior Learning Assessment Program at a State Institution: A Case Study.” They discussed how UT’s Prior Learning Assessment Program is structured and how they integrate best practices established under the Higher Learning Commission and the Council for Adult and Experiential Learning, as well as the University’s collaboration with the state of Ohio. Gleckler said the dean of the College of Adult and Lifelong Learning as well as the senior director for the college both sit on a panel with the Ohio Department of Higher Education that is formulating directives for the Prior Learning Assessment Program statewide. McDowell Tharpe delivered a talk titled “From Graduation to Orientation: Helping Upper-Division Students Navigate Their Last Two Years.” Her presentation was an overview of the advising model that is used in the college; she spoke specifically about the services for upper-division students. Fischer-Kinney teamed up with a peer from the University of Nebraska for a presentation titled “Leveraging Retention Software to Improve the Odds for Student Success.” The presentation focused on both universities positive institutional outcomes for improved student success and retention through the use of Starfish Early Alert and Connect. Both UT and the University of Nebraska were recipients of the 2015 Starfish Shining Star Awards, and both schools were selected to serve as panelists at the 2016 National Academic Advising Association Analytics in Academic Advising Seminar in Arizona next year. Creamer’s presentation on “Fear and Loathing: Math Requirements and the Adult Student” focused on the research surrounding math anxiety, math placement testing and math courses, and the challenge that adult students face with math requirements. She also presented strategies for faculty, staff and adult students on how to reduce math anxiety and increase student success. “When I received notification that I was not only chosen to present at the conference but also was receiving recognition from the National Academic Advising Association on my research on adult students and math anxiety, I was humbled that I was able to share my research and my advising and counseling experience with others who are interested in helping students succeed,” Creamer said. She said there is limited research on adult and nontraditional students’ needs, and she believes the information from her presentation will help others. Creamer’s presentation was one of three sponsored by the Advising Adult Learners Commission. McDowell Tharpe said that having a strong presence at the National Academic Advising Association annual conference shows that the professional academic advisers and staff at UT are passionate about what they do in terms of helping students succeed. “The fact that we had advisers who not only attended but also presented at the conference shows that academic advisers at UT are always trying to evolve to meet students’ needs,” she said. The University of Toledo was highly represented at a recent awards ceremony honoring local leaders. 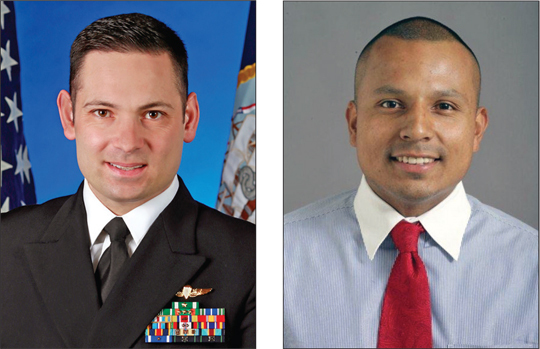 From a diverse pool of 148 nominees, Navy Reserve Lt. Haraz N. Ghanbari, UT director of military and veteran affairs, Jose Rosales, an academic adviser in the College of Adult and Lifelong Learning, and nine UT alumni were honored as recipients of the 20 Under 40 Leadership Award. The award has been presented to 20 individuals who are 39 or younger in the Toledo community who have demonstrated exceptional leadership qualities. Ghanbari works as a leader in many capacities of his life: serving in the military for 14 years and counting, including deployments to Afghanistan and Bosnia; participating in service work through Cedar Creek Church; and leading the University’s Military Service Center, to name a few. Ghanbari later received a proclamation from the governor of Texas — where Lucio was from — and was given the opportunity to speak to the student body in the school district where the woman worked for more than 40 years. His topic? Setting goals for yourself in life and how you can have a positive influence on others. He continues serving others through his career, working with veterans to achieve their academic goals. By paying it forward, Ghanbari hopes to improve as many lives as possible. Rosales’ philosophy is that connecting outside of the nine-to-five day is the work that really counts. As an academic adviser, Rosales works with conditional students — those below 2.0 grade point averages that are required to sign an agreement when entering the University — and helps them through any potential struggles they encounter. With his can-do attitude, Rosales gives 100 percent to everything he does — which, in his case, is a lot. In addition to his role as an adviser, he is a PhD educational theory and social foundations student, a combat engineer in the U.S. Marine Corps, campus adviser for the Latino Student Union, president of the alumni chapter of his fraternity, and he recently collaborated to bring back the Association of Latino Faculty and Staff. Rosales said his motivation was first inspired by his fourth-grade teacher who worked full time at a restaurant while she was teaching. Her passion to keep pushing herself to do well is something that inspired him and in turn what he tries to instill in students — particularly the students who would not have made it through college if they hadn’t received guidance. • Alicia Wagner, HEELS Coaching & Consulting — 2003 bachelor of arts degree. This year marked the 20th anniversary of the program with the 20 new awardees joining 380 individuals previously recognized. Nontraditional Student Recognition Week is a national celebration held the first week of November that gives The University of Toledo an opportunity to recognize the success and achievements of nontraditional students. At UT, the College of Adult and Lifelong Learning provides services to this growing student population and will host events throughout Nontraditional Student Recognition Week for students, faculty and staff. • Monday, Nov. 2 — Coffee Kickoff with Dunkin’ Donuts, 8:30 to 10:30 a.m. Current nontraditional students are invited to get free coffee and doughnuts in the Office for Adult and Lifelong Learning in Rocket Hall 1300. • Tuesday, Nov. 3 — Success Coach Tailgate at the Rockets vs. Northern Illinois game, 5:30 p.m. A pre-game tailgate with pizza will be held in the Rocket Hall parking lot. Families are encouraged to join. Kickoff for the game is 8 p.m.
• Wednesday, Nov. 4 — Dean’s Round Table, 11:30 a.m. to 1 p.m. Join Lettman in Rocket Hall 1319A for a free lunch and discussion about new trends and concerns for the nontraditional college student. RSVP to CALL@utoledo.edu. • Thursday, Nov. 5 — Second annual American flag retirement ceremony hosted by the Student Veterans of America UT Chapter, 11 a.m., the steps outside the Student Union. Ghanbari will speak at the ceremony and share the history of the flag, the proper way to dispose of a flag that is not longer suitable for display, and will preside over the retirement of several American flags from across campus. • Friday, Nov. 6 — The New Nontraditional Students: Who They Are and What They Need to Succeed, 9 a.m. UT faculty and staff are invited to a discussion and panel presentation providing insight into today’s new nontraditional student. The presentation will focus on needs, characteristics, and effective teaching and learning approaches for this growing population of students. RSVP by calling 419.530.3072. The first 20 participants at each event will receive a free Nontraditional Student Recognition Week T-shirt. The Nontraditional Student of the Year also will be announced at the end of the week. For more information, email call@utoledo.edu. For the third consecutive year, The University of Toledo has been named a Top Military-Friendly University by Military Advanced Education & Transition. While this designation underscores the efforts of the University and the Military Service Center, officials are continually looking to expand services to service members, veterans and their families. The Military Service Center is a one-stop shop for those eligible to receive Department of Defense or Department of Veteran Affairs educational benefits. Located in Rocket Hall, the center works closely with Adult, Transfer and Military Admission, Online Admission, and the various support and academic offices throughout the University. For more information, the Military Service Center can be reached at 419.530.VETS (8387) or click here. 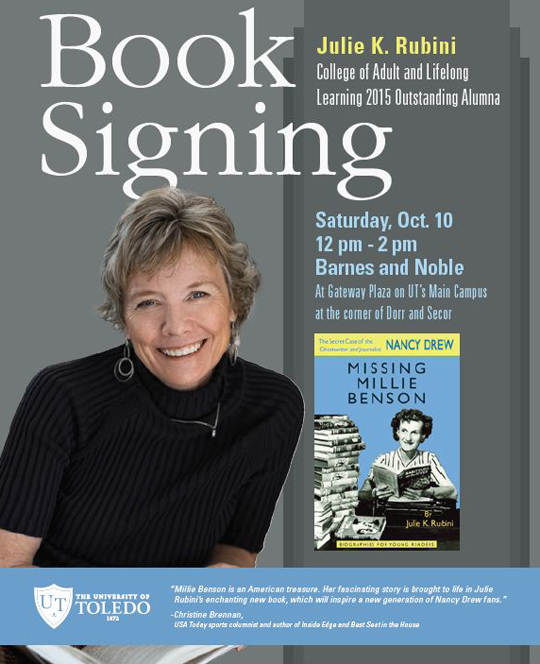 Julie K. Rubini, a 2013 alumna of the College of Adult and Lifelong Learning, will sign copies of her new book, Missing Millie Benson: The Secret Case of the Nancy Drew Ghostwriter and Journalist, Saturday, Oct. 10. The event will be held from noon to 2 p.m. at the Barnes & Noble University Bookstore in the Gateway Plaza. “I admired [Benson] for not only her role as author of 23 of the first 30 books in the Nancy Drew series, but as the author of 135 children’s books, as well as being a journalist and adventurer,” Rubini said. Along with being a journalist for The Toledo Times and The Blade, Benson pursued an interest in aviation by obtaining a pilot’s license. Rubini was commissioned to write Hidden Ohio, a children’s book on the history of the state, which was published in 2009. Before her books were published, she served as the director of sales and marketing for the Toledo Convention and Visitors Bureau and the Seagate Convention Center. Throughout the years, she freelanced for local and regional publications. In 2012, Rubini accepted the appointment to Maumee’s City Council and won re-election in 2013. Currently, she serves as chair of the Public Information and the Parks and Recreation committees. Rubini will be honored as the 2015 College of Adult and Lifelong Learning Outstanding Alumna at the Homecoming Alumni Gala and Awards Ceremony Friday, Oct. 9. For more information, go to julierubini.com. The College of Adult and Lifelong Learning at The University of Toledo is celebrating five years of mentoring nontraditional students. The fifth anniversary will be commemorated at the college’s annual scholarship recognition dinner Tuesday, June 2, at 6 p.m. at the Inverness Club. The college provides career and life coaching, degree completion and academic support to new, continuing and re-entering adult learners in a respectful and nurturing environment. Success Coaches help adult students transition to college life and establish a foundation for educational attainment and career success. The college utilizes the Prior Learning Assessment, which allows students to receive up to 30 credit hours for relevant work, volunteer and life experiences. The college offers class flexibility to work with a wide range of personal and professional schedules. As part of the college, the Military Service Center provides customized support for veterans and assists with the transition from military service to the classroom and beyond. The College of Adult and Lifelong Learning is an evolution of University College, which served nontraditional students for 40 years, from 1970 to 2010.